Nearly 18 hours of the most cutting-edge and time-tested triathlon knowledge from some of the world's leading authorities. 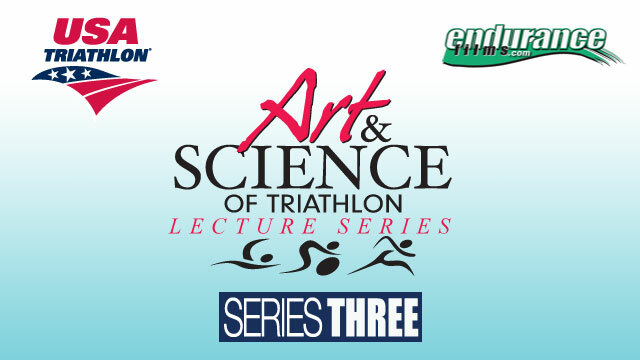 Recorded at USA Triathlon's 2012 Art & Science of Triathlon Coaching Symposium, this third series features an array of comprehensive presentations touching on every facet of triathlon coaching and training. Whether you coach elites, age-groupers or paratriathletes, or even if you are just an athlete yourself, this powerful video series is an indispensable resource through which you can discover the peak of performance potential. Featuring internationally renowned experts: Dr. Joe Vigil, Monique Ryan, Barrie Shepley, Robbie Ventura, Dr. Genadijus Sokolvas, Scott Schnitzspahn, Melissa Mantak, Dr. Massimo Testa, Ian Murray, Bob Seebohar, Sage Rountree, Bobby McGee, Brad Carlson, Gordo Byrn, Julie O'Neill, Derek Grabbert, Mark Sortino, Peter Harsch, Dara Wittenberg and Hunter Kemper. A presentation by elite coach Melissa Mantak, MA entitled - Periodization and Planning for Elite and Pro Triathletes. Recorded live at USA Triathlon's 2012 Art & Science of Triathlon Symposium. Topics include: Introduction and objectives, Overview of training variables and principles, Progressive overload - adaptation, Types of individuals, Principles of periodization, Phases of the year, Fitness development, Types of periodization, Block periodization, Planning a year: Annual Training Plan, Short term planning: Daily and Weekly, Intermediate planning, Short term planning sample week, Short term planning sample - non-draft athlete, Structure of a swim workout, Structure of a bike workout, Structure of a run workout, Sample workout plans by various coaches, Tips and samples from elite coaches and athletes, Race phase specific training. A presentation by Genadijus Sokolovas, Ph.D entitled - Use of Swim Power Test to Analyze Swim Technique. Recorded live at USA Triathlon's 2012 Art & Science of Triathlon Symposium. Topics include: Reason for Swim Power Test, Elements of the Swim Power Test, Relationship between force and velocity, Benefits of the Swim Power Test, Testing protocol, Typical mistakes in freestyle technique and how to fix them - Head and body mistakes, Breathing mistakes, Mistakes at beginning, middle and end of stroke, Kicking mistakes, Sighting mistakes, Video analysis.